Black PU Leather Ergonomic High Back Executive Best Desk Task Office Chair by BestOffice at Momiji Studios. MPN: OC-T41-Black. Hurry! Limited time offer. Offer valid only while supplies last. Do you want to add style to your home office or workplace? Then this is the chair for you. It has a very modern look to it, and high leather back. Do you want to add style to your home office or workplace? Then this is the chair for you. It has a very modern look to it, and high leather back. This item comes with a heavy duty metal base. The chair is made of PU leather that is oil and water resistant, and will also make it easy to clean if needed. The office chair is very padded for all day comfort, and even the armrest come with padding on them. 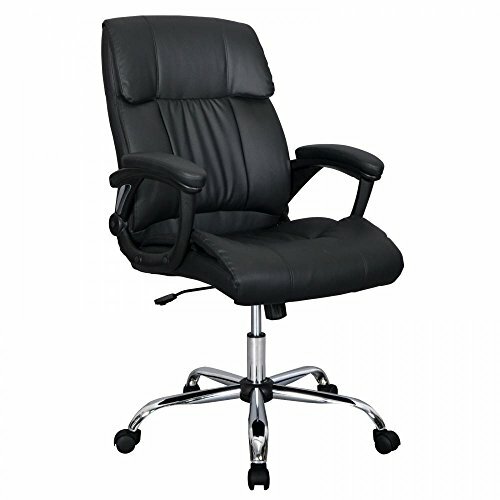 This is a 360 degree swivel chair, and comes with a pneumatic gas lift for instant height adjustment. The weight limit on this chair is 250 pounds. A 360 degree swivel chair. Made with PU leather: water and oil resistant. Padded chair with extra padding on the armrests. Height from ground to Seating Area: 17.7"- 20.5"